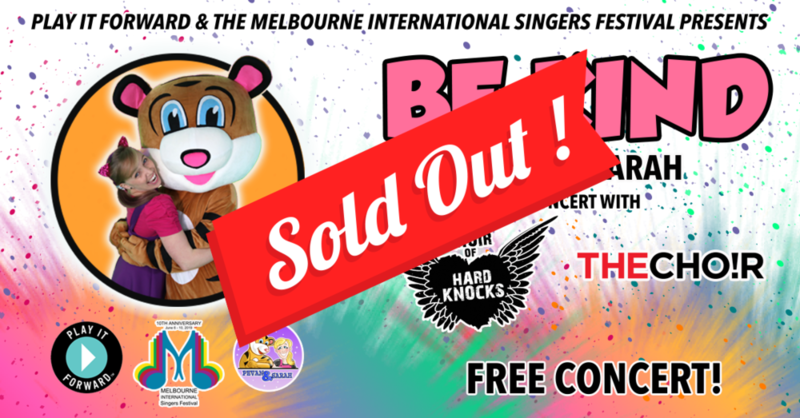 Enjoy a FREE concert with Pevan & Sarah, proudly presented by Play It Forward and Melbourne International Singers Festival, as they launch their new anti bullying song 'Be Kind'. Also featuring award winning conductor Dr Jonathon Welch AM with the Choir of Hard Knocks and THECHO!R. Learn the importance of being kind and how even the smallest acts of kindness can help in in the effort to eradicate bullying. Proceeds from sales of 'Be Kind' will be donated to Dolly's Dream who empower and educate the community to prevent bullying and cyberbullying. This concert would be perfectly suited to young children and their families as well as early years students and their teachers. Seats are limited, so please register for your FREE ticket.